Audiences 'Can't Help Falling in Love' with All Shook Up! Audiences were left wowed by the show's infectious energy, catchy musical numbers, and sweet story of love, music, and authenticity. Congratulations and thanks go to Director Fredreka Irvine, Choreographer Michelle Clark, Musical Director Aaron Mitchell, and all the students and parents who helped make Pacific Ridge School's 8th annual musical a big success. 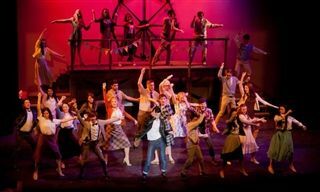 See the Pacific Ridge Facebook Page for more All Shook Up photos.